Funding? Check. Waiver forms? Check. Singlets? Check. Tents and chairs? Check. Food and Gatorade? You bet. But did we have a team? I was able to account for the 20 or so folks who had been coming to practice 3 times a week for the past 2 months, but we would need double that number to fill our roster for A and B teams for every race and relay. Two nights before our big meet, my co-captains and I sat down to pick relay strings and determine who would be running each event. We had received 42 entry forms(!) and each of those 42 had told us which lengths they wanted to race. We faced the monumentous task of aligning the lengths people wanted to run, how old the person was, their gender, and my knowledge about their speed to place them into relay strings which had certain restrictions as set by USA Track and Field. 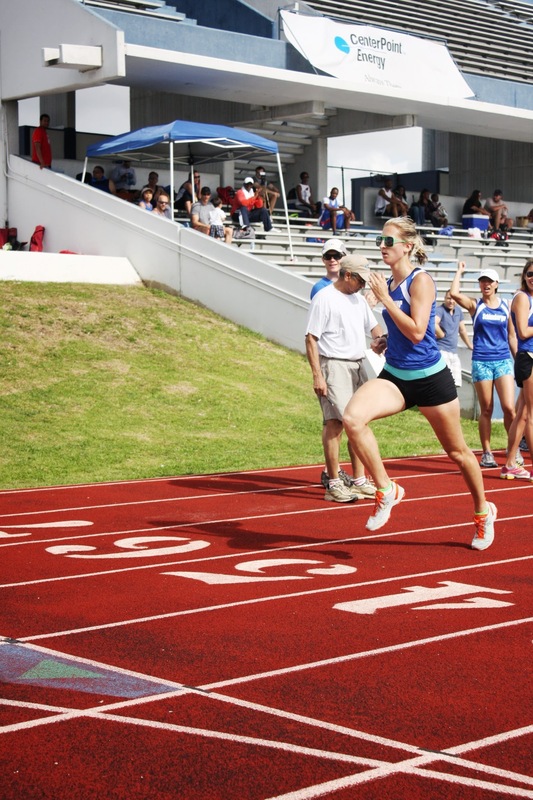 For example, in the Master’s Relay, all racers had to be 35 or above and a woman had to run the first 100m leg. After a long night that included a matrix filtered excel spreadsheet, we had our top individual racers and our A and B team relay strings picked. We were ready! 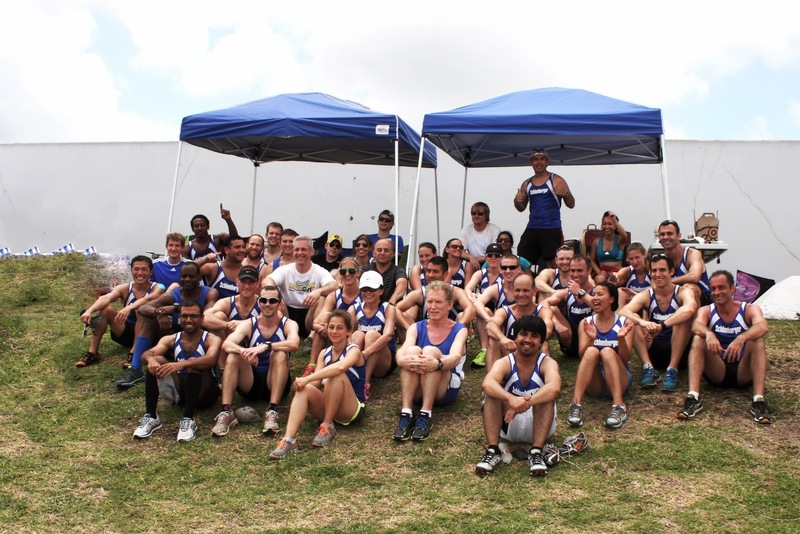 The Schlumberger Running Club had never been this organized for the Houston Regional Corporate Track Meet. The day dawned on an overcast sky and we were the first team at the track getting our tents up and coolers stocked to deal with the 93 degree day. Slowly, our team filtered in and picked up their singlets in Schlumberger blue. All the runners I had been training with for the past two months were ready; we knew we had a chance to make an impression this year. I also got to meet a lot of runners who, due to time constraints, weren’t able to make it to practices. They were happily surprised with how organized we were this year. I yelled at the guys to get ready for the first event of the day, the Men’s 3000m. The announcer came on the loudspeaker welcoming everyone to the race – Shell, BP, Centerpoint, Lockheed, Exxon, BHP Billiton, and Chevron – and told the guys to head to the start line. A huge field of over 40 men waited for the gun, including 7 of our Schlumberger guys. A speedster from Chevron killed the pack with a time of 9:27 for the 7.5 laps. One of ours came in second, followed by the rest of the guys in the top 15. We were looking good! Now it was my turn to see if the training I had been leading my team through had benefited me. I’m not sure why I decided to race the 3000, but I figured it would be a nice warm-up before the three 800m I had to race later in the day. It was a huge field of women, and I took a lead out of the start line with two other women. One was a blazer, there was no way I was going to catch her, but the other from Shell, I knew I had. She was keeping a good 6:15 mile pace, and I camped out directly behind her, feeding off her and using her to block the breeze. About lap 5, she was fighting to hold on. I could hear her breathing get worse and worse and I knew it was time to pounce. I overtook her on the outside (much to the dismay of Shell) and bumped up my pace. It was an easy 2nd place finish at 11:38. So much for it being a warm-up. Our team knew that we had everyone’s attention. We snagged another 2nd place finish in the men’s mile and I grabbed us a 4th in the women’s 800 at 2:43. Next began a long list of both sprint and distance relays, each with a different team of people. Exxon handed it to everyone. Their sprinters are top notch and they blew everyone away on almost every relay. Almost. Fortunately, we had our secret weapon- Jerry, a 60 year old marathoner who had won his age group at Boston. With Jerry on our side and some other very fast folks over 40, we took 3rd for the Master’s relay, 2nd place in the Submaster’s distance relay, and 1st in the Executive relay! The cheers from our tent were by far the loudest! We were having so much fun and we were actually winning something! The last race of the day was the Sprint Relay with 6 legs of a 200, 200, 400, 400, 200, and 200 that had to include two women and one racer over 35. I had stacked this team with my fastest runners from practice and boy, was it a nail-biter. By the first 400, we had a significant problem sitting in almost last place by 20 meters or so. But our team was determined to get on the podium! Both 400 runners killed it with under a minute legs and with a perfect hand off, one of the Slb girls took out 2 competitors on her fifth leg 200. We were in fourth! Could we get there?! 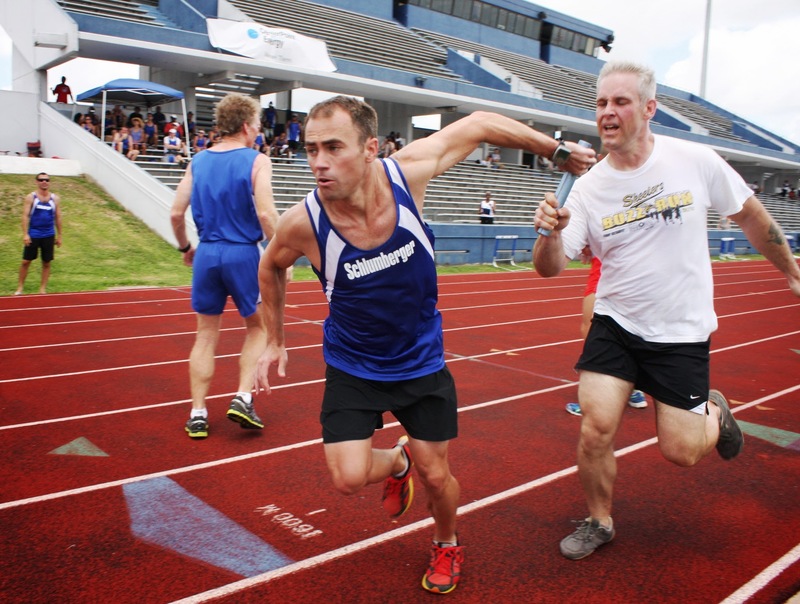 I had placed my ringer sprinter in the anchor leg. And boy did he run! He caught up to the fourth place runner and took him out. We had come in 3rd! Our tent (situated quite strategically next to the finish line) exploded and we ran onto the track to greet our relay team. Pictures were being taken all around and we were so thrilled with what an amazing day we had. I lined up for a picture with my co-captains on the track. Little did we know that some of the boys carrying a cooler full of ice water were posed to strike. 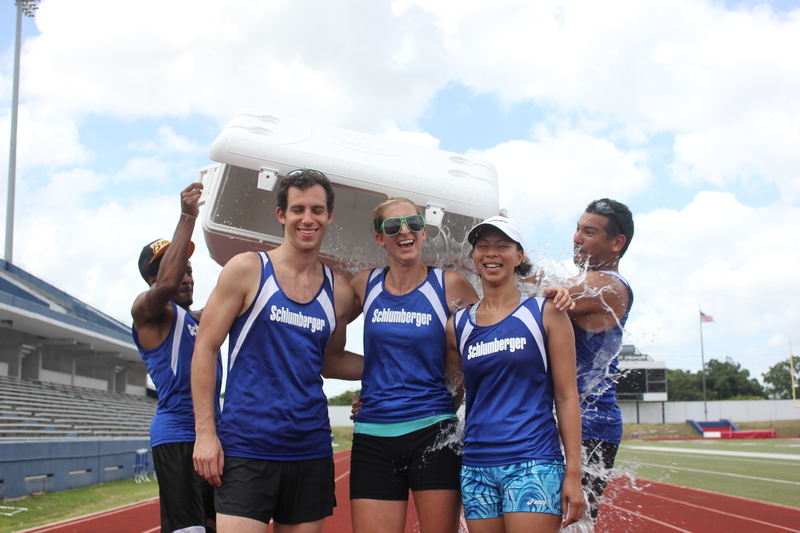 As I got dumped on by ice water I felt like a real coach. We definitely cheered our team-mates on the loudest! The emotion! The meet had ended but the team places were yet to be announced. 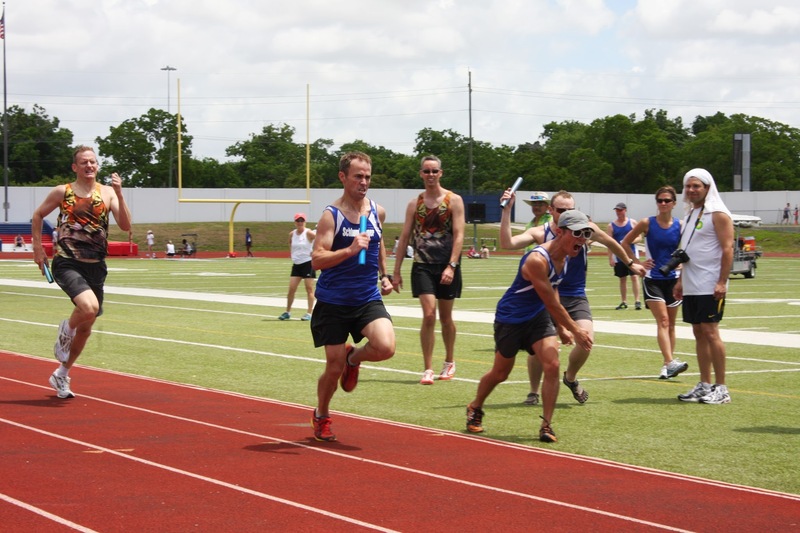 The winning of the meet for Corporate rules is determined by team points which include the combination of the individual events, the field events, and the relays, broken down as well by age group of the runner. Older people = more points. We knew that we had done really well, but would we get on the podium? The announcer called out third place – BP. Maybe we were second? Nope – Shell. And of course, as with every year, Exxon was first. But, the announcer stopped and turned to look at us. In fourth, he said, was Schlumberger, by a single point. Our season was over. There would be no advancement for us. BP had received 144 points. Schlumberger – 143. Naturally, we were heartbroken. A single point! But we had done better than any other year. We had so much fun and had made so many new friends that it didn’t matter. We felt proud to be Schlumberger. PS. The feedback I have received from coaching the team has been truly inspiring. 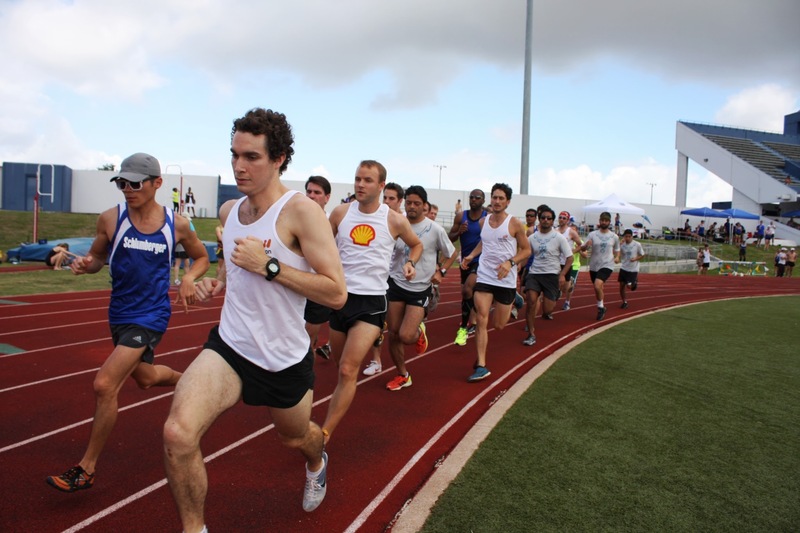 Through this experience I have pushed myself and my fellow runners to our limits as athletes, both in creating my workouts and enforcing them. I never thought that coaching a team, even just a corporate team, would be so influential, but it has been one of the best experiences of my running life. I’ll be back at it next year.